Raymond Anderson Hanshaw2,3,4 [Anderson Hanshaw5]. After his mother committed suicide in 1914, Anderson was apparently raised by his aunt Ollie (Hanshaw) Jennings. 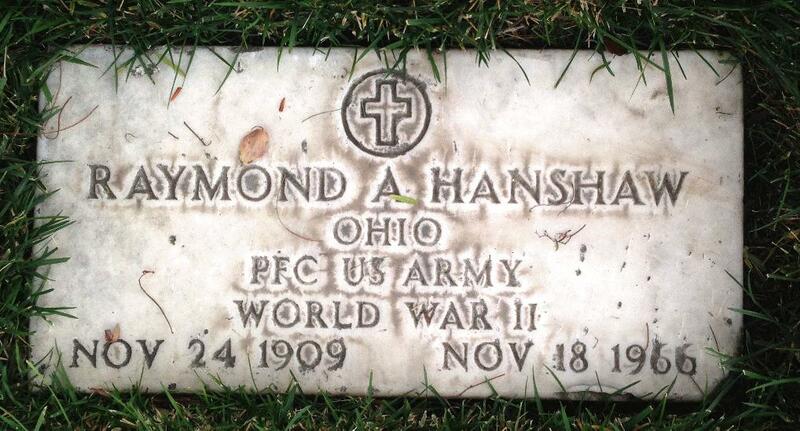 Hanshaw, Raymond, head-of-household, age 20, born in Ohio; father born in Virginia; mother born in Ohio; first married at age 17; rented home ($30 rent); radio in home; occupation: truck driver, R.R. ; not a war veteran. Hanshaw, Emma, wife, age 19, born in Kentucky; parents born in Kentucky; first married at age 16. Hanshaw, Charles, son, age 2, born in Ohio; father born in Ohio; mother born in Kentucky. Hanshaw, Raymond, head-of-household, age 29, born in Ohio; completed 2 years of college; on Apr 1 1935 was living in the same place/city; rented home ($35/month rent); occupation: timekeeper, W.P.A. ; worked 12 weeks in 1939; $308 wages in 1939. Hanshaw, Lillian, wife, age 29, born in Michigan; completed 4 years of high school; on Apr 1 1935 was living in the same place/city. 1930 census, 3rd Ward, Portsmouth, Scioto County, Ohio; roll T626-1868, ED 34, page 14A, line #46, dwelling #334, family #347. 1940 census, Columbus, Franklin County, Ohio; roll T627-3247, ED 93-214, page 2B. 1940 census, 3rd Ward, Portsmouth, Scioto County, Ohio; roll T627-3143, ED 73-45, page 4A, line #5, household #74.